Happy Friday everyone! It's a short week for many, but they always feel longer to me as you have to try to fit 5 days of work into 3. I didn't quite make my July 4th deadline for a ripe tomato, but that's okay. 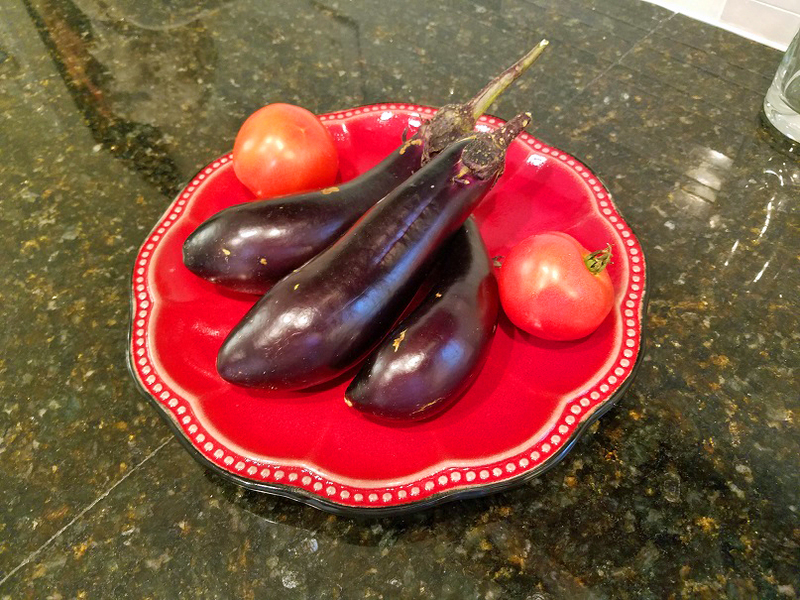 This little plate of loveliness will be grilled up and made into some yummy bruschetta for dinner tonight. 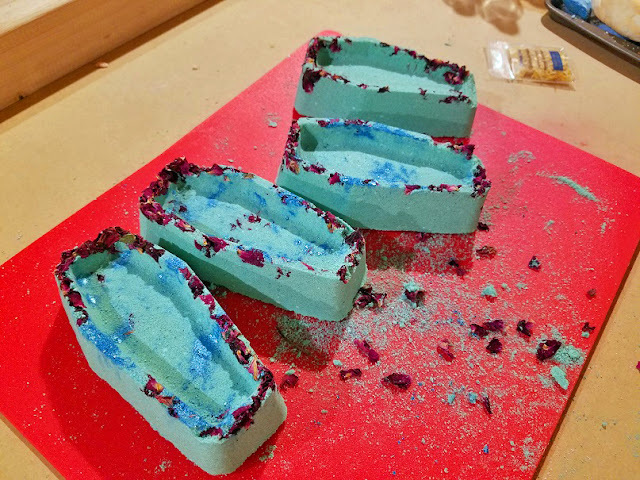 I gave my first shot at coffin bombs and they turned out pretty cute. The rose petals made the sides crumble off a little, but otherwise, I think it's a good start. I'm going to take them to my UPS lady today; I'm sure she'll be thrilled! Coffin bombs...for people dying to take a bath! I made some more 100% Olive Oil soap in "Peppermint Patchouli". I love to use peppermint soap in the summertime; it's so refreshing and cooling after a hot day outside. I'm pretty set on my Olive Oil soap ingredients and process and it's one of the most favorited soaps from my friends and family. "Savon de la Bonne Mere Marseille" means "Soap of the Good Mother from Marseille" LOL! I tried another batch of my "Old Faithful" 5-oil soap recipe with the 15% water discount to see if it would give me the same results and it did. 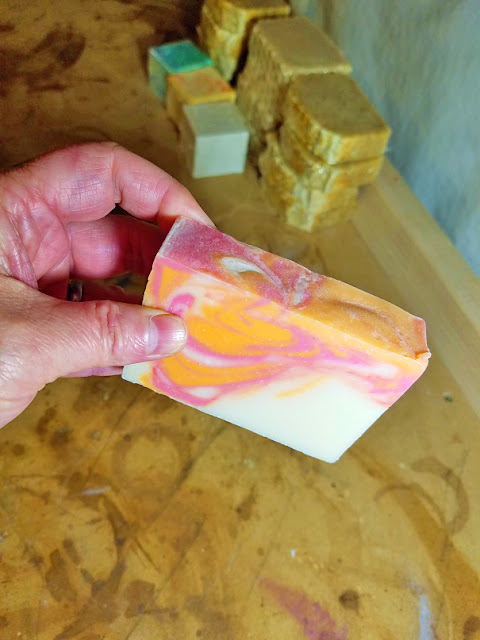 I made a "Summer Melon" soap using a melon/peach blend of Fragrance Oil (FO). It turned out nice, but has a little soda ash on top. Making soap is a lot like making pickles: you don't know what you've got until they're ready, and that can take a while. 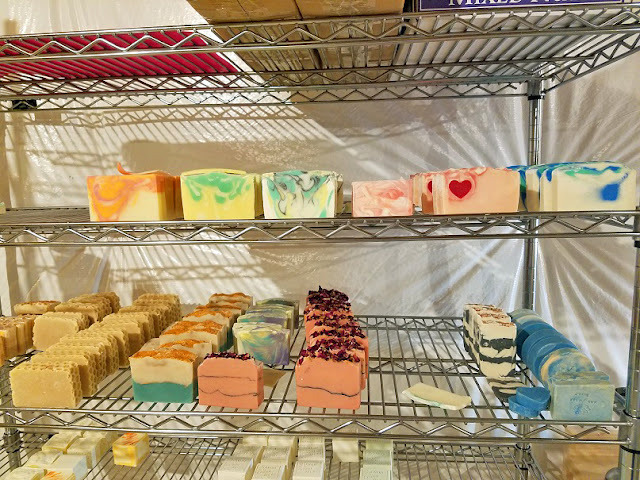 So, I think I am going to hold off making more of my "Old Faithful" soaps for a while until some of the newer soaps cure and I can try them out in the shower/bath. Need to test drive some of these soaps! My earlier batches of soap over the past months had a tendency to be scratchy, even when I didn't add any exfoliating clays or charcoals. I think that was due to me not knowing about melting my solid oils down enough and the stearic acid within the oils wasn't dissolving. I want to see how my newer soaps, where I've melted my oils clear, perform and feel in the shower/bath and I need to let them cure. I don't want to waste expensive ingredients on soap that doesn't measure-up. I don't get the coffin soap. You'll have to explain that one to me. 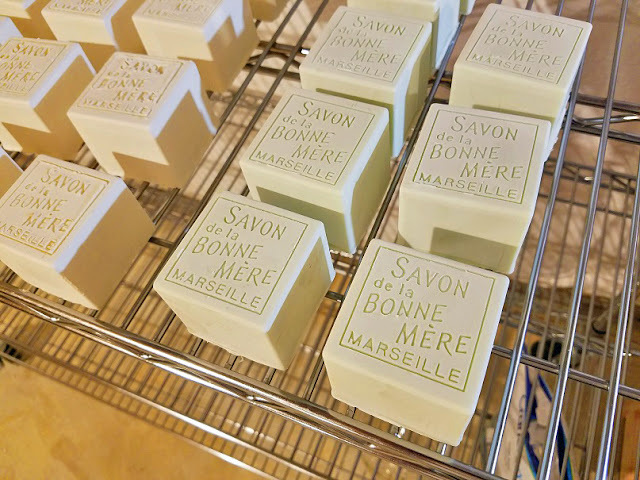 The stamped cubes of soap are gorgeous. That's a pretty photo. 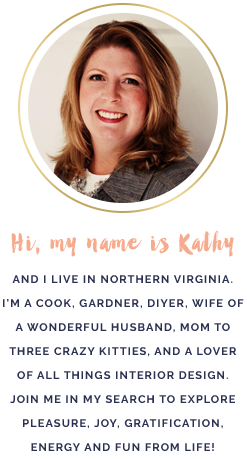 Great job on your soapy posts and products. I enjoy following your progress. LOL Mary, the coffin bath bombs are a steam-punk/goth-lite sort of thing. They're really popular around Halloween.